Telling someone they should be looking forward and not looking back can be the hardest sentiment to get across with sincerity. In an ideal world we would all do this, and there would be no such word as regret. The key to this philosophy is to learn from the mistakes you have made in the past, and learn from them rather than dwell on them. 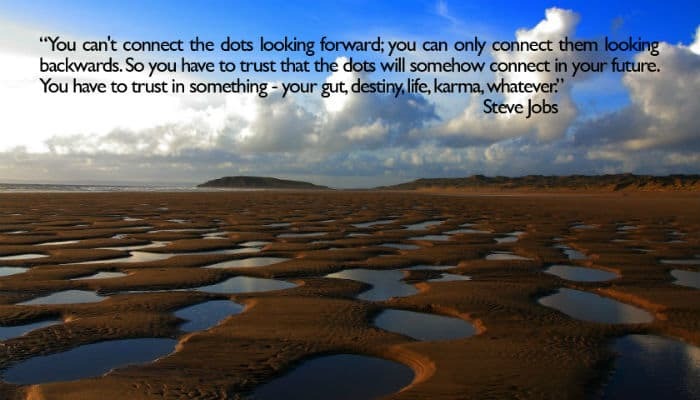 What you have done in the past will determine your future, and never was this philosophy so eloquently put as in this classic quote from the late Steve Jobs “You can't connect the dots looking forward you can only connect them looking backwards. So you have to trust that the dots will somehow connect in your future. You have to trust in something: your gut, destiny, life, karma, whatever.” These words feature on these Forward Thinking business ecards against an image of small pools on a beach left behind by the tide. This can be the perfect of way to let somebody know you believe in them to make the right decisions in the future, and it may be just the support somebody in your workplace needs if something did not turn out as they planned. How does your business celebrate Christmas holiday with clients? If you want to wow your clients then consider using our business holiday ecards this year.